We offer an assortment of used and refurbished Refrigerators and Freezers. Our Refrigerators range from Basic Lab Refrigerators, Chromatography Solid Door Refrigerators/ Glass Door, Flammable Refrigerators, to Explosion Proof Refrigerators. Some of our popular manufacturers include Revco, Thermo Fisher, VWR and Marvel. 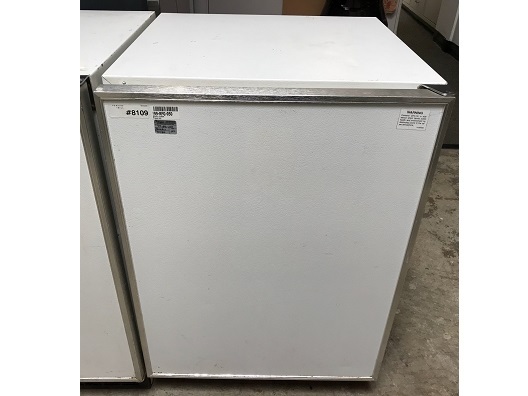 Our Freezers from Basic -20 Freezers, Flammable Freezers and Explosion Proof Freezers to -40 Freezers, -80 Freezers Uprights and Chest Freezers. Some of our popular manufacturers include Revco, Thermo Forma, Fisher, VWR and Sanyo. We also feature new and refurbished Scottsman Ice Flakers. Please see our demo page for more information. Feature forced air ventilation, eliminating the need for clearance space in built-in applications. They fit easily under lab benches and casework. They also feature a manual defrost system that protects freezer contents from auto defrost thaws and dehydration. Freezers have flat door liners, one wire shelf, adjustable microprocessor-based thermostat and manual defrost. This 24 inch undercounter refrigerator has a high capacity of 6.1 cu. ft.